nice movie really enjoyed it. The scene you mentioned about Emraan’s expression at the urinal was the first thing i noticed when i saw the trailer n thought atlast Emraan has got a movie to show his acting skills. but again whats the point in making these so called Socially relevant movies. If filmmakers really wanna do something for the society or care for the society n country or change something then they should do something instead of making movies on it, cos people forget everything when they get out of the theatres. thats why i prefer masala entertainer, action n sci-fi movies. Krishnan is not from the development firm. Krishnan is actually an officer/bureaucrat who works for the state government. Typically such officers are civic (non-partisan) postings but report in to Chief Minister (played by the plump lady). Chief Minister is an elected official and in-charge of running a state government (equivalent to state Governor in the US). The other high ranking guy that Krishnan talks to near the end of the movie is a high ranking minister from Central (Federal) government. Anyways… Indian government/political setup can be difficult to follow and it can get frustrating to understand all the details in such a political thriller with out clear narration. I think you still captured the overall mood of the film in your review and deserves 3.5stars. Thanks so much for clarifying Krishnan’s position, Dallas Dude! I’ll make the correction in my review. And thanks for explaining who the guy Krishnan talks to is. 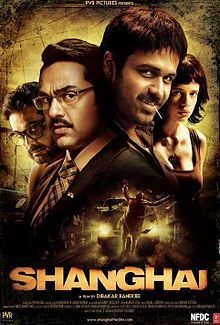 I would’ve liked it if director Dibakar Banerjee added a couple of lines to clarify character names and positions. He could’ve done that and still kept the movie’s runtime under two hours long. But i didnt really get who gets Dr. Ahmadi killed and how is it that suddenly his wife becomes the candidate? I’m with you, nk. I’m not sure why Dr. Ahmedhi’s wife suddenly takes an interest in politics, even while her husband is lying in the hospital. It’s obvious that she is disillusioned about the whole social work thing and then she is obviously offered a position by the government at the center so that they can put there own woman (her) in power in the state. She gets allured by the obvious money involved and the position of power. I think you’re right, perryizgr8, but I don’t think her motives are obvious. There’s further speculation about her motivations below in this comments thread. This is to clarify the confusion regarding krishnan and his boss. His boss is the Principal Secretary to the Chief Minister. The second person of importance Krishnan speaks with is the state leader of the political party that rules India and who were about to announce a political coalition with the party ruling the state. Using India’s unique coalition politics Krishnan is able to score a victory. As regards the prolonged end, it was necessary to show the gruesome twist in the tale. The story leaves enough doubt, or no doubt, that the Chief Minister became a victim and thru her the viewer of a deeper political assassination plot. One more point, the last scene shows that Dr Ahmedhi’s wife may have plotted his murder. She was disgruntled by her husband’s pseudo ideology and amorous adventures. She had stated that she began pursuing her own political career after following Dr Ahmedi in vain “for four years without winning a single resettlement” for the displaced poor whose cause Dr espoused. The moviemaker gives another hint of her sinister plot to the viewer early on in the movie where she goes into a toilet a cries despite showing complete calm outside. She looks at her comatose husband more in disgust than in pain outside. That private weak moment was a moment of remorse. Thank you so much for explaining coalition politics and Dr. Ahmedhi’s wife’s motivations, Sharad! I guess it’s a sign of the film’s quality that I enjoyed it as much as I did while clearly missing some critical information. 🙂 I’ll be eager to watch Shanghai again on DVD, knowing what I know now. This makes me wonder if there would have been an elegant way to include details about Indian politics in the story to assist foreign viewers without slowing the pace of the film for Indian audiences. I’m thinking of the way subtitles sometimes inform foreign viewers about language, something like, “Thank you, bhai (brother)!” I don’t know that there is such a way to include more complex information subtly, and it’s certainly not necessary. Just thinking out loud. Most Bollywood movies can be accused of overstating a point. Perhaps Shanghai is the first that can be accused of under-statement. ‘Excessive minimalism’, if such a contradiction-in-term may be allowed by the English language. It is as if the Director overdid subtlety. Dr. Ahmedi has been shown as a dark character, almost as dark as the politicians he fights. A typical leftist character from Indian academic canvas. Often girl students fall for their pseudo-idealistic, utopian and fiery discourse. Both Shalini and his wife were his ex-students. The moments where Ahmedi’s wife interacts with Shalini and the way she looks at her – subdued hate and disgust – are brilliantly portrayed. As regards foreign viewers, all I can say in the defence of the movie maker is that Indian politics and bureaucracy are complex for even Indians to understand fully. I will try to explain a few points that may help you when you watch the movie the second time. – Why Shanghai? A decade back, a political party had promised to turn Mumbai into Shanghai\. Since then the city has slid into a permanent decay. It is now a political joke. At another level, the title takes a dig at our mistaken belief that we are still competing with China. – Politcal: In the movie there are three poltical parties. Most prominent is the Bharat Nagar city party led by Deshbandhu. The second is party ruling the state. Third is the party ruling the country. At city level, that is the pecking order too (even in real life). National parties may win national elections but come a poor third in state assembly elections. Their state leaders just lurk around looking for some intrigue like that national party leader Krishnan speaks to after speaking to Kaul the principal secretary. – Bureaucracy:: Krishnan and his boss Kaul are from Indian Administrative services (IAS). You just have to watch “Yes Minister” the BBC series, to understand their working. – Why does the Chief Minister want to hush up the enquiry? At an apparent level, she may have ordered Dr Ahmedi’s execution. But if she had not, and it was Dr’s wife as is my contention, then she was in no doubt that her Bharat Nagar political ally Deshbandhu was involved. She needed his party’s support to run her coalition govt. Sharad, you are a gem! Thanks for taking the time to explain things so fully. “Excessive minimalism” is an apt way of describing the problem. It seems the perception of politicians is the same everywhere. In India, this feeling has gone to a dangerous extreme. Not that it is entirely flawed. A few exceptions does not a rule make. The danger lies in the fact that this perception gives the politician a licence to be corrupt, to steal from people. A positive expectation and perception sets a weighty moral dilemma that is hard to breach for most but the most shameless. Coming back to the movie. Kaul, the chief minister and everyone else with the exception of Shalini, did not bother to suspect foul play. These things happen. Aware, back of the mind. But, Unimportant. Common place. Move on. The story teller seems not to tell of corruption in the name of progress. That is known, and a thousand movies on the subject later, accepted. The main import of the movie is that of an utter helplessness and irretrievable rot in the system. Mrs. Ahmedi’s Chief Minister is more evil, more sinister than the one replaced. In that sense, this movie breaks a Bollywood rule. Without exception, our movies, however desperate times they project, end with an ultimate victory of truth over falsehood (Satyamev Jayate). Our story telling never rose above the parameters set by our religious epics Mahabharata and Ramayana. This movie breaks that rule thru its dark ending. Mrs. Ahmedi the CM and the truck driver assassin, now earth mover driver, as the demolishers of Bharat Nagar. I guess the filmmakers took it as a given that everyone feels politicians are corrupt and instead chose to focus on two outsiders: Shalini and Jogi. It does provide the audience a more accessible way to connect with the film. It becomes a totally different story if Krishnan tries to change the system from within. That would’ve been interesting as well, but not as easy to relate to. do watch Khosla ka ghosla (khosla’s nest) from the same director. Thanks for the recommendation, shrey! I just realized that reading your Review before writing mine, has seriously corrupted the things I would’ve said, considering you mirror a lot of my sentiments. I thought this was Emraan Hashmi’s best performance to date, simply for the fact that it goes against everything he’s set up of his image as an actor in Bollywood. That takes balls, and I respect the hell out of that. This and THE DIRTY PICTURE hopefully makes him turn a new leaf and do some serious roles with hefty makers. Sorry for inadvertently wrecking your review, but I’m glad we agree on this one. 😉 Hashmi’s so much better in the roles he’s played lately than when he was playing a generic hero. There are plenty of less-talented model-actors out there who can do that, and not enough performers with the guts to take on grittier roles. Good that he appears to be choosing the second path. 1) The last scene shows Mrs. Ahmedi to be the next CM and yet, continues the IBP project in spite of her husband sacrificing his life fighting against the same? 2) • Why would the CM get involved directly in such a small controversial & risky setup? Hi, Deepak. In the comments above, Sharad Gupta speculated that Mrs. Ahmedi may have plotted her husband’s death to further her own political ambitions (and perhaps to get back at him for his affair with Shalini). I think Sharad is probably right. I’m not sure about the CM’s involvement, but money surely had something to do with it. Hope this helps! I agree with Deepak on the doubt of CM’s direct involvement in such a risky set up . Ending of the movie makes it quite clear that Mrs Ahmedhi was involved in her husband’s killing in want of power which she finally gets .She becoming CM immediately after, unravels the deeper political power nexus in which she seems to be involved right from the beginning .